March 29 – April 14, 2019 at Uptown! Knauer Performing Arts Center in West Chester, PA.
Two con men collide with the elite of the French Riviera in this Tony Award winning musical! 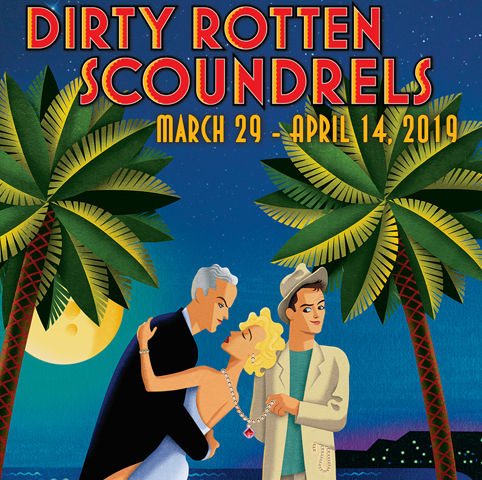 Based on the popular 1988 film starring Steve Martin, Dirty Rotten Scoundrels takes audiences to the French Riviera for hijinks and hilarity. Sophisticated, but with a good dash of mischief, this hysterical comedy features a Tony Award nominated score by David Yazbek (The Full Monty) and was nominated for a staggering eleven Tony Awards in all. After meeting on a train, two con men attempt to work together, only to find that the small French town isn’t big enough for both of them. They agree on a settlement: the first to extract $50,000 from a young female target wins, and the other must leave town. The suave scoundrel, Lawrence Jameson, is played by Mark Woodard and the part of Freddy Benson, who more humbly swindles women by exploiting their compassionate side, is played by Lukas Poost. The two first joined forces on RTC’s inaugural hit Monty Python’s Spamalot! and are excited to reignite their stage chemistry in this hysterical farce. Additional RTC alums are back for more, including Bailey Seeker, who appeared in RTC’s Bullets Over Broadway last spring. The cast is packed with talent including Lawrence’s quirky French assistant, played by Jonathan Hadley, who appeared on Broadway in Jersey Boys. Murial Eubanks, an attractive American socialite and con-victim is played by Sarah Solie, whose Broadway credits include Mary Poppins, Cats, Beauty and the Beast and Annie. Jolene Oakes, a third energetic heiress, is played by Australia native Philippa Lynas, whose credits include Carnegie Hall and the UK National Symphony. Kristin McLaughlin Mitchell, who spent almost two decades as an actress and director in New York City before moving to West Chester, is The Resident Theatre Company’s Producing Artistic Director and the award-winning Dann Dunn, last seen in West Chester creating the choreography for Evita last fall, will choreograph the show. Make time for laughter and live theater this spring.